The second presenter for this session was Susan Bowler, under the title of Robotics in the Classroom, a topic I had heard much praise for, but with which I had no experience, and only limited curiosity. 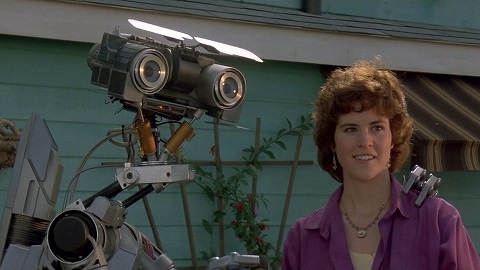 For some reason when I think of robotics in any context, I get one of two images in my head, that of Short Circuit, from the 1986 movie of the same name, or ‘Arnie’ as the Terminator. I’m not sure why that is, but there you have it. It seems that Robotics in the classroom can be as expensive as you want to make it, but it can also be done on a shoestring budget, with prices starting, at this point in time, for around USD$30 for Arduino and Raspberry Pi all the way up to the top end, which is apparently the Lego MindStorms. Two online resources were mentioned as being particularly useful: the Lego Education website and Damien Kee’s website. Other sites of interest include the RoboCup Junior website which also contains a document with a draft unit of work in scope and sequence format, StemCentric, and the Dr Graeme site. Additionally, Robogals is an organisation that focuses on increasing the rate at which females become involved with science and technology, and are able to do school visits to drive robotics interest among the girls of a school. Posted on March 23, 2015 March 20, 2015 by Brendan MitchellPosted in EduTech, FutureSchools, RoboticsTagged 21st century learning, ClassTech, education, EduTech, FutureSchools, Robotics. Previous Previous post: FutureSchools ClassTech Conference Review. Day 2 Session 2 – Stop! It’s roundtable time!